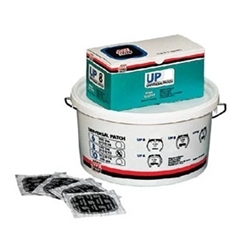 Rema Tip Top 5/16" Universal Patch BOWES RTR UP-8 Tub of 150. REMA TIP TOP's rubber-reinforced, Universal repair units are specially formulated to provide maximum flexibility and strength. These non-directional, center over injury repair units perform flawlessly in both radial or bias-ply tire designs.